You have reached an inactive product page. To find the new version of this product, see the IVP Bible Background Commentary, Old and New Testament (2 Vols.) here. Including both the Old and New Testaments, the IVP Bible Background Commentary 2 Volume Bundle is a complete resource that provides the detailed historical, archaelogical, and cultural backdrop to the Bible. Illuminating the scriptures with this background information allows for a more thorough understanding of the Bible. The IVP Bible Background Commentary: Bundle includes the The IVP Bible Background Commentary: Old Testament and The IVP Bible Background Commentary: New Testament. Critical to studying, understanding and applying the Bible is a knowledge of the Bible itself, as well as an understanding of the cultural background of the passage you're studying. With an understanding of the text's background you can more easily grasp the author's original concerns and purposes. The Bible Background Commentary provides, in verse-by-verse format, the crucial cultural background needed for responsible--and richer--Bible study. It includes a glossary of cultural terms and important historical figures, maps and charts, up-to-date bibliographies, and introductory essays about cultural background information for each book of the New Testament. Based on ten years of in-depth study, this bestselling commentary is valuable for pastors in sermon preparation, for Sunday school and other church teachers as they build lessons, for missionaries concerned not to import their own cultural biases into the Bible, for college and seminary students in classroom assignments, and for everyday Bible readers seeking to deepen and enhance their study of Scripture. Written by Craig S. Keener, professor of New Testament at Palmer Seminary (Wynnewood, Pennsylvania). Mr. Keener has written a dozen books, three of which have won Christianity Today book awards: his commentaries on Matthew, John and the background commentary. Crucial to understanding and apprehending the Bible is an understanding of the cultural, archaeological and historical background of the scripture you are studying. The author's purpose becomes much clearer with a more richly understood background. The IVP Bible Background Commentary: Old Testament sifts through the massive quantity of data, analysis and study done by historians, archaeologists and social scientists on the Ancient World and gleans the important facts and theories that can inform the student of the Bible. Going on a verse-by-verse basis, this resource also includes maps, charts and a glossary of terms. 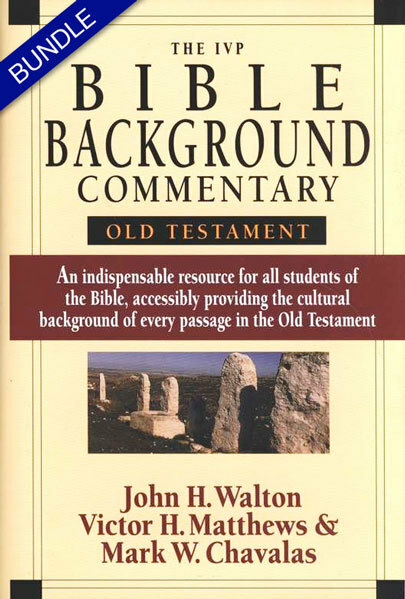 The IVP Bible Background Commentary: Old Testament is a valuable aid for pastors preparing sermons, missionaries concerned about reading their own biases into the Bible, seminary and college students completing assignments and papers, and all Bible students who desire a deeper, richer understanding of the Bible.